In graduate school, I did my dissertation on effortful control, which is really a fancy way of describing the skills children use to control impulses. To do this we used several games to test 4 and 5-year-old’s self-control abilities. The games we used were similar to Simon Says, or games that asked children to move-slowly, wait their turn, following a change in the rules or switch between two sets of rules. All of these kinds of games were designed to specifically measure how well children had developed executive thinking. It is no coincidence that games are a great way to help our kids practice these skills and not just a way to test their skills. 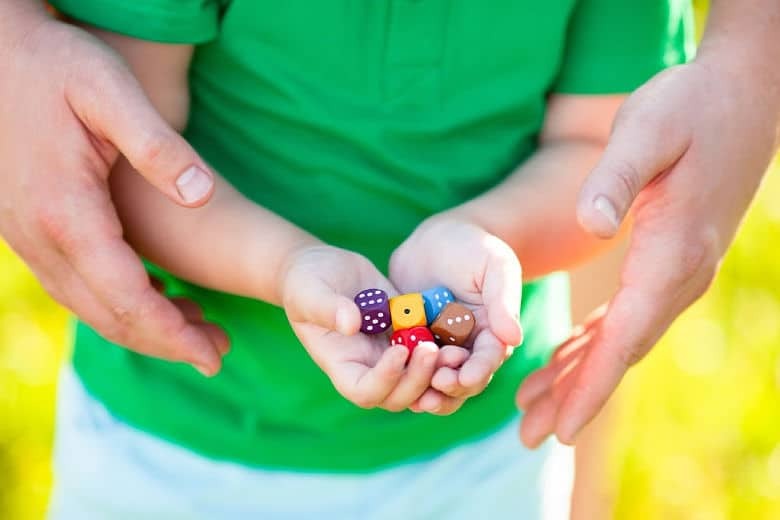 The Center for the Developing Child at Harvard University recommends that to help 5 to 7-year-olds develop executive function skills you should play many kinds of games with your kids. 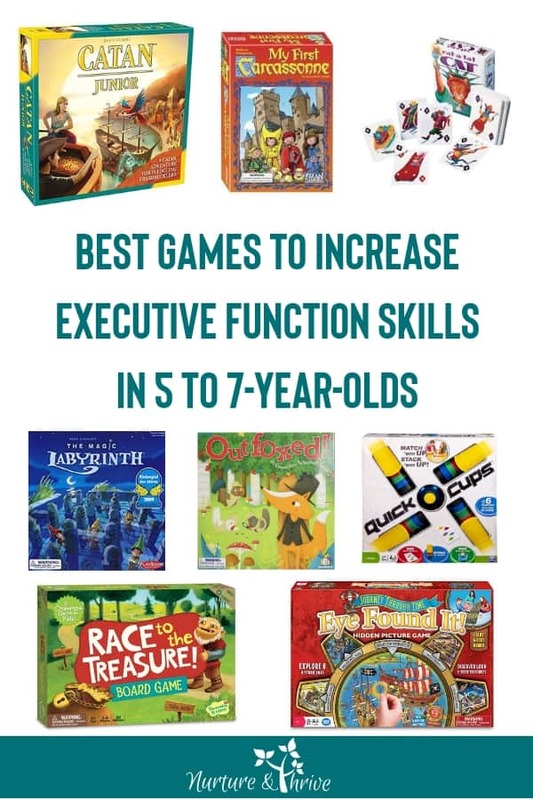 Games that challenge memory skills, attention skills, quick-response games, strategy games, logic and reasoning games, guessing games, and I spy games are all games that give kids the opportunity to practice executive function skills. I’ve included a link to their activity guide at the bottom of this post. Games are listed from least challenging to most challenging below. 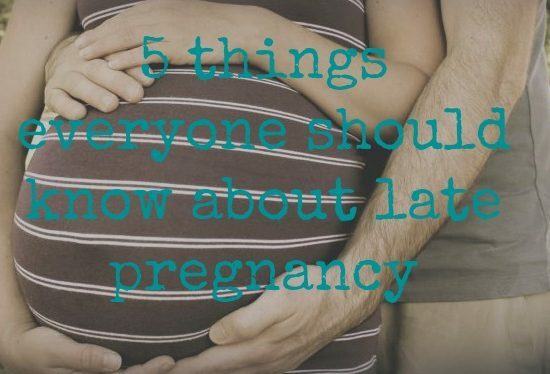 Some of the games on this list will be too hard for a 5-year-old, but they will grow into it soon. To truly practice these skills you want a game that is challenging for your child, but not too challenging– something that they can master with practice. You will also notice that your child may focus in on one aspect of strategy, ignoring others. Go at their pace with this — you may gently point out other strategy choices (or simply model them), but I mostly prefer to let them discover this on their own as they play over and over. You can literally see the “lightbulb” go on when they realize a new way to win the game. Reading is not required for any of these games. 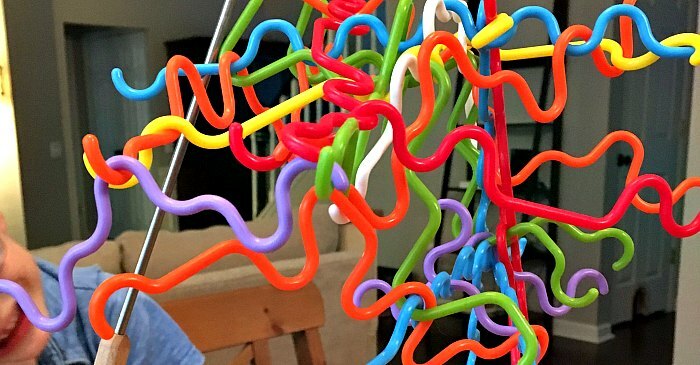 Melissa and Doug Suspend Junior Age 4+, 1-4 players, 10 mins. The object of the game: Don’t Knock it Down! Players are supposed to use one hand to hang their piece on a spot that isn’t occupied. You can modify the one hand rule if it is too challenging. The first to run out of pieces wins the game. This is a really fun and quick game that is actually quite challenging. Skills Practiced: Planning, decision making, attention, following instructions, impulse control, taking turns, and regulating disappointment, excitement, and frustration. Eye Found It! Hidden Picture Game Age 4+, 1-6 players, 20 mins. We got this as a gift and my 5-year-old loves this game. The board is 6-feet long and has different time periods from prehistoric to the future. The object of the game is to get home before your time machine runs out of fuel. It is a cooperative game — meaning that players work together to get the time machine home. Cooperative games are nice because children can be mentally challenged without having to regulate the disappointment of losing. As you move along the board you also search for objects and place finder rings on the board. The search for objects is similar to the “I Spy” books and is great for practicing attention skills. Skills Practiced: Focused and selective attention, working memory, categorization, taking turns, counting, prioritizing, and following instructions. Race to the Treasure Age 5+, 2-4 players, 20 mins. The goal of this game is to plot a course to the treasure before the Ogre gets there. Players work together to win the game and beat the Ogre. I absolutely love that in order to set up the game, children will be using basic graphing skills. 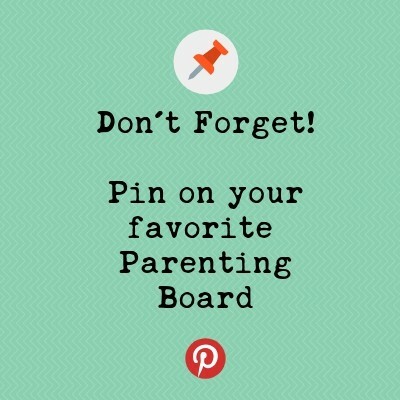 This one is great for spatial attention and planning. It has also was several awards, including the PAL (Play Advances Learning) seal of approval. Skills Practiced: Spatial planning, working memory, inhibitory control, cognitive flexibility, basic graphing, prioritization, coordination, taking turns, following instructions, and cooperation. Outfoxed Age 5+, 2-4 players ,20 mins. My son got this game for his 5th birthday from his cousin and we love it! The object is to discover which fox stole Mrs. Plumpert’s prized pot pie before the fox escapes. Players work together (cooperative game) to beat the fox. Like a game of Clue, players use dice to uncover suspects and clues. I think this may be my favorite game to play on most days because it’s entertaining and pleasant — it’s cooperative so I don’t have to be prepared to help my son handle disappointment and I don’t have to think as hard as I do for some of the more challenging memory or strategy games, but it’s not boring either. Catan Junior Age 6+, 2-4 players, 30 mins. This is the junior version of the Settlers of Catan games. If you are a Catan fan, you will love introducing your child to this game series. 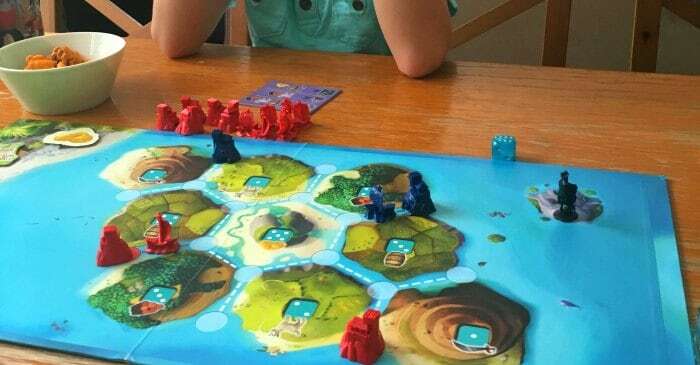 If you are new to Catan but you like strategy games, this game is a great introduction into a world of games that you can play with your kids forever. My brother-in-law introduced us to Catan and it is so cool to see how he and his brothers still gather around their parent’s table at holidays to play. These days that table has grown as the brothers bring home their own families and pass on the game and the tradition. In this junior version of the game, the object is to collect resources in order to build pirate hideouts or “lairs” and ships. The first player to have 7 pirate lairs wins the game. Players must think about where to build lairs in order to get resources that they need, watch out for the ghost pirate, and evaluate trades with the bank, the market or other players to get the resources they need. 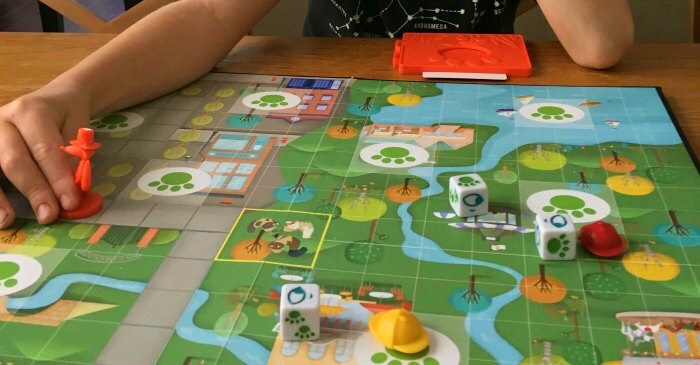 This is a great game for developing critical thinking skills. Skills Practiced: Planning, working memory, inhibitory control, taking turns, prioritizing, competition, cognitive flexibility, counting, and critical thinking. My First Carcassonne, Age 4 and up, 2 to 4 players, 20 mins. 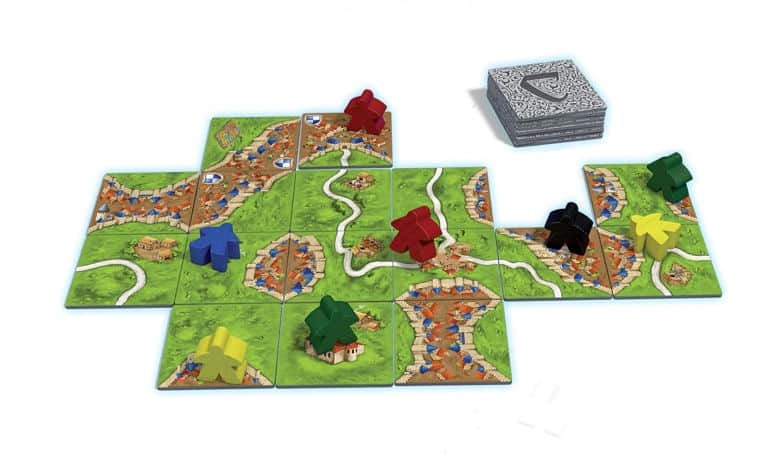 & Carcassonne, Ages 7 and up, 2 to 5 players 35 mins. These are our new favorite games. 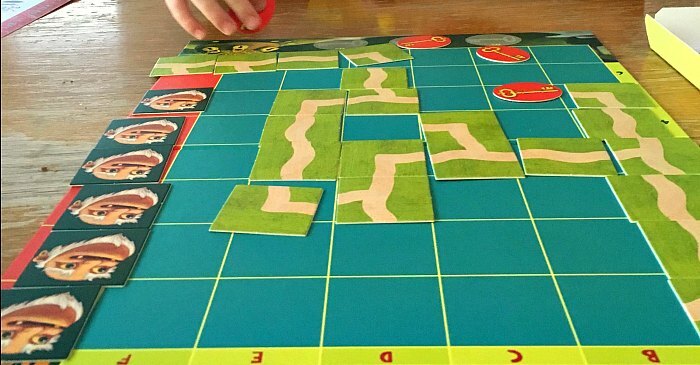 We started with My First Carcassonne, but my son is 7 now and we like the regular version better. If you have an older child, skip the junior version. In this game strategy for what you build and where you build it is key. You need to plan ahead, weight options, and make decisions. This is truly a fun game for adults and kids both. Another fun aspect of this games is that it changes every time you play it because you recreate the game board with each game. This keeps the game fresh and interesting. Magic Labyrinth Ages 6-99, 2-4 players, 20-30 mins. This is my 5-year-olds favorite on the list and perhaps mine too. It is a gorgeous and brilliant game that is challenging and captures the imagination of children. Winner of the Kinderspiel des Jahres in 2009 (and 14 other awards! ), this is a game that really challenges self-regulation skills. Every time I ask my son if he wants to play a game — this is his first choice. The object is to collect 5 magical symbols by moving your wooden character along a board. But watch out! Invisible walls block your path! As the instructions say “Labyrinth, turn around, walls disappear, ways will be found.” The wooden characters are magnets for a metal ball that you place under the board. 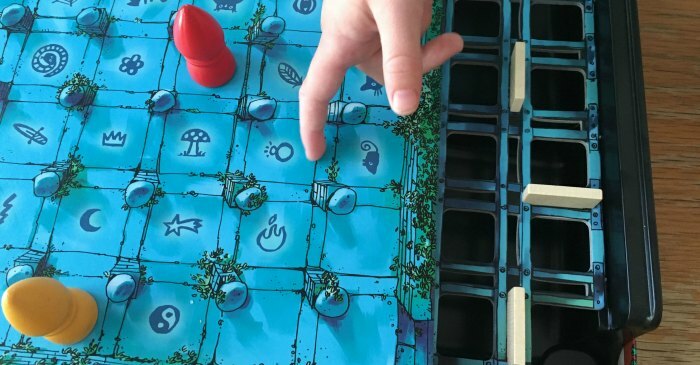 Beneath the board is a grid-like structure that holds wooden “walls.” To get to the magical symbols you have to learn the path through trial and error. The challenge is remembering the path. Honestly, your child may be better at this than you are. Maybe that is why it’s my son’s favorite — he knows he can beat me. Ha! My mommy-brain is no match for his 5-year-old memory. Keep in mind though, this game can be very challenging. If you child gets frustrated, put it away and try again when they are older. Skills Practiced: memory skills, inhibitory control, taking turns, prioritizing, competition, cognitive flexibility, counting, and critical thinking. 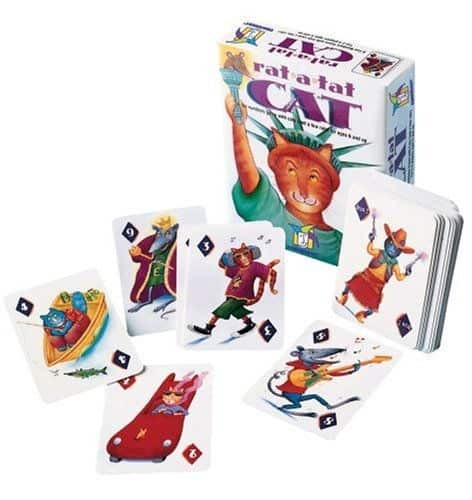 Rat-A-Tat-Cat, Age 6+, 2-6 players, 20 mins. This is another more recent favorite. 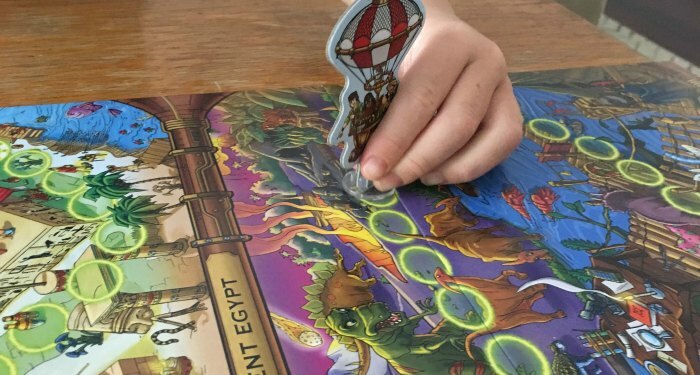 Winner of the Oppenheim Toy Portfolio Platinum Best Toy Award and the Mensa 1996 Best New Mind Game Award, this is a fun and fast-paced card game that challenges memory, strategy, timing, and math skills. This is another one that is fun for both adults and kids. If you are anything like me, your memory isn’t what it used to be, so while adults have more stategy and math skills than kids– they often have better memories, so it is fun for everyone!! Quick cups Age 6+, 2-6 players, 15 mins. This is a “fast response” game. 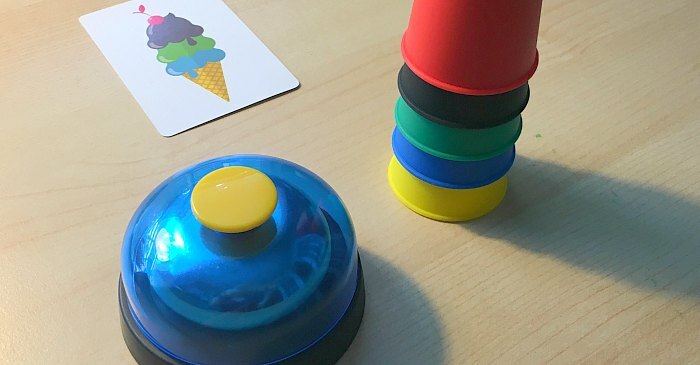 The object is to match the order of colors on the card either vertically or horizontally with your stack of cups. The first one to finish rings the bell. A quick-paced, fun, and challenging family game. Challenging is the keyword. This is just on the cusp of difficulty for my 5-year-old, mostly because of the racing aspect. If he races on his own, he does fine. But if I try to play with him he gets so distracted by what I am doing that he can’t focus on his stack. That takes ALOT of regulation. I imagine at age 6, he will love this game. This game requires cognitive flexibility at a quick pace — you have to change how you stack based on the direction of the card. This is a hard skill for kids to master and truly fun for the whole family. Skills Practiced: Attention, cognitive flexibility, quick decision making, inhibition, taking turns, competition, and working memory. I am always on the lookout for great children’s games. Comment below and let me know what your favorites are and I will check them out! Here is the link to the Center on the Developing Child’s guide to developing self-regulation and executive functioning skills in children at all ages. Great list of games. I for one have had a hard time on figuring out which games are best for developing function. Parents I highly recommend these mental games that will help your children in developing their mind and self-control.